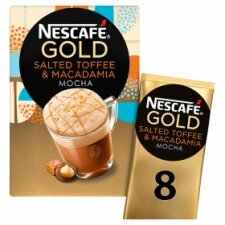 A blend of Instant Coffee, Finely Ground Roasted Coffee Beans with Skimmed Milk Powder, Drinking Chocolate, Sugar, Natural Flavour and Coconut Oil. Unwind with friends and family and savour a special moment with Salted Toffee and Macadamia Mocha. 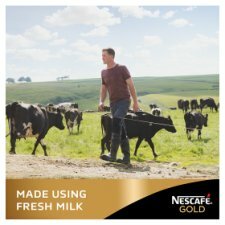 NESCAFÉ is the world's favourite coffee brand, enjoyed in over 180 countries worldwide. With 80 years of experience in selecting, roasting and blending the very best coffee, it's no surprise that over 5,500 cups of NESCAFÉ coffee are drunk every second! Did you know we offer a wide variety of flavoured drinks? 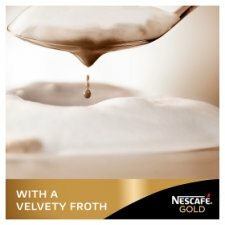 Why not try our NESCAFÉ GOLD Toffee Nut Latte? Enjoy our indulgent new instant mocha with salted toffee and macadamia flavour!